The ability to transfer knowledge effectively in the networks of small and medium-sized firms (SMEs) is paramount for supporting firm competitiveness. Our research is the first one that explores the joint effect of trust and control mechanisms on knowledge transfer in the case of networks of SMEs. We use a multiple case study approach based on six Italian networks of SMEs. We analyse the joint impact of different ethical based trustworthiness factors—namely benevolence and integrity—and the levers of control (LOCs)—namely, belief, boundary, diagnostic and interactive LOCs—on knowledge transfer between SMEs in networks. We find that trust substitutes for the implementation of boundary, diagnostic, and belief tools, while it works jointly with interactive tools in order to support knowledge transfer. These insights not only provide a rich foundation for follow-up research, but also inform SME managers about how to increase the effectiveness and efficiency of knowledge transfer with their network partners. When, in 1268, the Doge of Venice, Ranieri Zeno, died, he left 132 carte di commenda with a value of almost 20,000 Venetian lire, representing 60% of his total financial wealth, which was anything but small. In medieval Venice (and Europe), the carte di commenda were the tool used by traders to collect money from wealthy people in order to set up a trade. In fact, the trader would use the money he was entrusted with to buy products in Europe, with the intention of selling them in the Middle East. The income was used to buy new products (typically spices) that would then be traded in Europe upon his return. The profit from the trade was split between the trader and the wealthy financiers according to the proportions set out in the carta di commenda. The key aspect of such contracts was that the wealthy financier had no real or effective control over the trader or the trade: the “partnership” was based on trust that the trader would behave properly in buying and selling the products and would disclose with honesty the profit made on such trades (Cipolla 2002). Nowadays, management theory insists that business relationships (like that between the wealthy financier and the trader) are adversely affected by conflicting interests: agency theory (Jensen and Meckling 1976), transaction cost economics (Williamson 1993), and even stakeholder theory to some degree (Freeman 1984) examine the clashing relationships between business partners and suggest tools and frameworks that have the scope to deal with such conflict. This typically happens either via the implementation of a control mechanism to curb adverse behaviour or through the creation of incentives to stimulate proper behaviour. However, trust as a variable is far too important to be overlooked (Welter 2012): Bromiley and Harris (2006) argue that excluding trust from relationship models partially reduces their quality; meanwhile, including it shifts the perspective to interpersonal ties and relationships (Barney 1990). Interestingly, empirical research supports this consideration and emphasizes that its presence reduces agency problems (Ring and Van de Ven 1992), the costs of monitoring and control (Zand 1972), and the use of legalistic remedies (Sitkin and Roth 1993), and aids decision making in situations where information is scarce (Luhmann 2000). Trust is even found to have a positive effect in lending relationships (Moro et al. 2014; Moro and Fink 2013) and generally contribute to build the ground for cooperation in multi-stakeholder networks (Roloff 2008); it is helpful in risky situations where the potential damage is greater than the advantage to be gained, and where the observation of past behaviour and information that is collected independently from the relationship play an important role (Fink and Kessler 2010). All in all, trust is a key aspect that is used by human beings to deal with risk. One high-risk situation that firms face is linked to knowledge management, particularly when this implies creating and sharing knowledge not only within organizations, but (as is increasingly the case) in inter-firm networks (Nahapiet and Ghoshal 1998). At first sight small firms may be perceived as entities that face a reduced risk in terms of knowledge management since everything is strongly embedded in the firm. Thus, it is not surprise that smaller firms tend not to implement formal tools to share and protect the knowledge their produce. In fact, small firms’ management can easily access information about firm’s current status because of the daily interaction with all the major actors in the firm. Similarly, know how can be easily transferred among firm’s staff in informal way. However, acquiring, generating and sharing knowledge with others (outside of the firm) are viewed as primary processes in organizational evolution (Thorpe et al. 2005). Learning from others’ experience through a process of knowledge transfer is a key way to foster a firm’s competitive advantage (Hutzschenreuter and Horstkotte 2010). Interestingly, this applies particularly to SMEs, where critical knowledge is increasingly residing outside the formal boundaries of the organization, and collaboration is becoming a crucial method of transferring and leveraging vital knowledge (Chen et al. 2006; Lang et al. 2013). When firms decide to exploit collaboration in order to expand their knowledge, they are typically asked to make their know-how available to others: they benefit from a greater amount of information but, by sharing information, they also bear the risk that shared information can be misused by other members of the network. Broadly speaking, working in network changes the rules of the game. It raises the question about how to be sure that the information and the knowledge shared with other members of the network is properly used and managed. The same applies to tangible and intangible assets. Thus, small and medium firms that mainly rely on informal control mechanisms face the challenge of deciding which control tools they should implement in order to monitor and protect their own interests. More importantly, such a decision is not unilateral since it depends on the decisions of other members of the network. Research has been paying growing attention to how firms control such transfers of knowledge (Easterby-Smith et al. 2008): on the one hand, formal mechanisms of control may support knowledge transfer as long as they do not compromise the relationships among actors; on the other hand, informal mechanisms such as trust can be cost-efficient, effective and powerful means of coordinating knowledge-sharing behaviour within a network (Stouthuysen et al. 2017; Geneste and Galvin 2013; Fink and Kessler 2010). Research highlights that control and trust affect each other, since control influences the level of trust within a network and trust may impact on the functioning of control (Strätling et al. 2013; Bachman 2001; Sengün and Wasti 2009; Inkpen and Currall 2003). Interestingly enough, irrespective of the previous research that suggests an interaction between trust and control, no empirical research exists that describes control/trust interaction and the effect on knowledge transfer. The present research fills this void and describes how trust interacts with control mechanisms in order to stimulate knowledge transfer in networks of small and medium-sized firms (SMEs). We decided to focus on SMEs because of the crucial role they play in the success of national economies. Interestingly, despite their growing importance, only a small portion of the literature addresses the topic of knowledge transfer within and between SMEs (Sanzo et al. 2012; Chen et al. 2006). Trust and control can operate in a synergistic way: they complement each other so that by exploiting trust the firm can reinforce the successful use of specific control mechanisms. Alternatively, trust and control can act in an antithetical way: they are alternative tools that substitute each other so that by leveraging trust the firm has to reject the use alternative control mechanisms. In order to explore the interplay of trust and control mechanisms (at both the synergistic and antithetical levels) and the impact of this interplay on the dynamics of knowledge transfer, we use a comparative case study approach (Yin 2009) of carefully selected six networks of SMEs in northern Italy. The approach allows us to explore in detail both the similarities and the differences in the way the networks deal with knowledge transfer and the control they implement in order to be sure that there is no mismanagement. The qualitative analysis of interviews, meetings that we have been able to attend and documentation allows us to identify common patterns and specific decisions. By relying on both emerging common patterns and specific/peculiar behaviours, we have been able to disentangle the link between knowledge transfer, trust and control mechanisms. Even though we are aware that knowledge transfer implies knowledge creation, this study does not investigate the knowledge creation process, but focuses on knowledge transfer and how it is affected by the link between trust and control. The analysis suggests that trust and control can be antithetical (they substitute each other) or synergistic (they work jointly) in supporting knowledge transfer—depending on the level of ethical reasoning. The results contribute at the theoretical level, expanding previous research on both, control and trust. We find strong empirical evidence that both trust and control are relevant in knowledge transfer. Our findings are at least partially at variance with previous research that either stresses the role of trust or the importance of control on knowledge transfer. Thus, we provide a more nuanced description of the interplay between trust and control. Our findings are also relevant from the practical point of view. They stress the importance for detailed investigation of the relation among business partners in order to figure out which approach facilitates the knowledge transfer in a network of SMEs. Our study suggests that a network of SMEs should balance control and trust in order to facilitate knowledge transfer, thus making the network and the firms more effective (by reducing potential conflicts and misunderstandings through the exploitation of ethical behaviour) and more efficient (by reducing the monitoring costs linked to unethical behaviour). The paper is structured as follows. In Sect. 2 we discuss previous research on knowledge transfer, trust and management control systems. Section 3 describes the methodology while Sect. 4 provides the analysis and the main findings. Section 5 presents the results that are then discussed in Sect. 5. Section 6 concludes. A lot of research effort has been spent on investigating knowledge management since its identification as a key factor in firms’ success (Grant 1996). Similarly, recent research in areas as different as management (Hatak et al. 2015; Fink and Kessler 2010; Fink and Harms 2012), accounting (Aschauer et al. 2017), and finance (Fredriksson et al. 2017; Moro and Fink 2013; Moro et al. 2015) has investigated the role of control as a tool for dealing with agency costs (Jensen and Meckling 1976) and for stimulating firm performance (Simons 2000; Martyn et al. 2016). The scientific interest in trust has also spanned several disciplines, including areas such as psychology, sociology, management and finance (Bachman and Inkpen 2011). This section briefly illustrates previous findings and overlaps in these three different areas. Knowledge transfer in networks is the result of complex processes wherein the characteristics of the donor organizations and their representatives and those of the recipients are just the extremes of the process (Easterby-Smith et al. 2008). The knowledge economy implies that firms should try to share as much knowledge as possible in order to exploit it (Timonen and Ylitalo 2008). Therefore it is important to stimulate knowledge transfer by reducing all barriers. Indeed, research suggests that knowledge transfer can be facilitated by members’ learning intent (Simonin 2004), trust, shared ethical and moral values/systems, social embeddedness (Dhanaraj et al. 2004), institutional and social ties between different organizations (Bell and Zaheer 2007), the willingness of individuals to contribute their knowledge to the system, and the rate at which individuals access and reuse knowledge within the system (Watson and Hewett 2006). However, knowledge sharing also implies an assumption of risk linked to the behavioural uncertainty (Möllering 2001) of one’s business partners: the recipient of the information can damage the donor either by leaking the information or by misusing it for their own benefit. The damage can be particularly harmful in the case of small businesses that develop new products or processes. As far as the leakage issue is concerned, partners can leak very sensitive information to competitors about business performance, business strategy, etc., as well as about the people who work in an organization. Actually, the leaking of information can happen involuntarily (von Rheinbaben and Ruckes 2004) but in this case too it can adversely affect the donor. As far as the misuse of an organization’s information is concerned, it can be carried out by unfaithful and unethical employers/partners that use the information for their own interest. It can adversely affect reputation, damage sales, lead to the imposition of fines, and harm the image of the firm. The typical way firms deal with this risk is to set up formal control tools, ring fencing knowledge against improper exploitation by unethical recipients. The problem is that such tools can compromise the advantages of the exchange of knowledge since they create barriers to knowledge transfer (Mason and Leek 2008; Strätling et al. 2013). In this scenario, the ethical evaluation of the recipients is an important part of deciding how an organization manages knowledge and the tools it uses to stimulate the exchange and ensure the protection of its knowledge. In society, trust was long ago identified as a strong tool that could be used to reduce the risk of defecting behaviour. In the early twentieth century, the Austrian writer Egon Friedell postulated: “The most reliable way to make people decent is to take them for decent”. The importance of trust in business relationships is highlighted by various authors (Welter 2012; Barney and Hansen 1994; Fink and Kessler 2010; Howorth and Moro 2006). Becerra et al. (2008) suggest that knowledge transfer, as an endeavour with high levels of behavioural uncertainty, calls for high levels of trust. Indeed, trust supports arrangements that imply intensive behavioural uncertainty because of intensive knowledge exchange, such as inter-firm cooperative network relations (Doz 1996; Van de Ven and Ring 2006) and alliances (Gulati 1995); it is critical to decisions where information is scarce (Luhmann 2000) and it reduces monitoring and control activities (Zand 1972) and affects performance (McEvily and Zaheer 2005; Gaur et al. 2011). As trust may effectively coordinate the interaction partners’ behaviour and encourage it towards fair conduct (Fink and Kessler 2010), it reduces behavioural uncertainty (Möllering 2001) and thus positively impacts on knowledge transfer (Geneste and Galvin 2013; Squire et al. 2009; Zaheer et al. 1998). Indeed, Meier (2011) argues that knowledge transfer is supported by a trust-based relationship between the interaction partners. Similarly, Muthusamy and White (2005) empirically find, in strategic alliances, that trust between partners is positively related to learning and knowledge transfer. As there is no generally accepted concept of trust (Korsgaard et al. 2014; Li 2007; Ring 2003), the present work relies on the well-established model suggested by Mayer et al. (1995), who define trust as “the willingness of a party to be vulnerable to the actions of another party based on the expectation that the other will perform a particular action important to the trustor, irrespective of the ability to monitor or control that other party” (ibid, p. 712). Trust is based on the personal predisposition to trust and on three trustworthiness factors: ability, benevolence and integrity (Mayer et al. 1995). Ability consists of attributes such as skills and competence and is domain-specific. However, Tinsley (1996)’s critique that ability—in referring to the interaction partner’s ability to perform as promised—captures confidence, which is a construct that is different to interpersonal trust. Thus, trust can be only referred to benevolence and integrity. Benevolence is the extent to which a trustee is believed to voluntarily do good for the trusting party. In the context of intra-firm network knowledge exchange, benevolence refers to the willingness of a network partner to be helpful by providing valuable information. Finally, “[i]ntegrity is the trustor’s perception that the trustee adheres to a set of principles considered acceptable to the trustor” (Mayer et al. 1995). In intra-network knowledge exchange, integrity implies that both parties share the same vision about which knowledge to use and how to use it in a coordinated way. In line with prior research (Lopez-Valeiras et al. 2016) we use a broad definition of management control systems introduced by Chenhall (2003): According to this definition management control systems consists of a “systematic use of management accounting to achieve some goals” and “other controls such as personal and clan controls”. The management control system assists the management in decision making by providing external information, a broad array of decision support mechanisms, and informal personal and social controls (Chenhall 2003) and helps managers and employees to access knowledge (Henri 2006). While according to this definition management control systems comprise social and formal controls, in this study we focus on the formal controls only. Management controls systems are not only used to supervise but also to coordinate (Ahrens and Chapman 2004). Thereby, management controls systems provide a platform for trust and cooperation not only on intra-firm level but also on inter-organizational relationships (Vélez et al. 2008). They can be used to enable managers and employees to search for opportunities and solve problems, fostering a dialogue within and between organizations (Cugueró-Escofet and Rosanas 2013), and also with stakeholders (Asel et al. 2011). 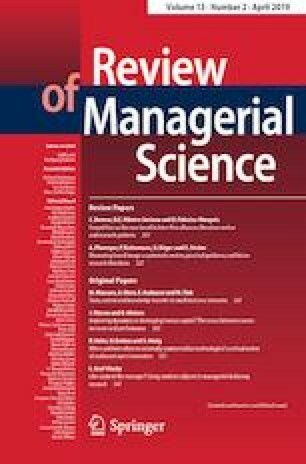 Previous literature has shown the crucial role of management control systems on organizational innovation and knowledge creation (Lopez-Valeiras et al. 2016; Mundy 2010). One of the most commonly quoted frameworks (Martyn et al. 2016) for explaining how management control systems work is suggested by Simons (1995). While Simon’s (1995) framework has been initially developed as a framework for intra-firm relationships, only recently it has also been applied for inter-firm relationships (Kominis and Dudau 2012; Rodrigue et al. 2013). He identifies four systems of levers of control that are used to exercise control, naming them LOCs (levers of control): belief, boundary, diagnostic and interactive systems. The belief system is “the explicit set of organizational definitions that senior managers communicate […] to provide basic values, purpose and direction for the organization” (Simons 1995) and which supports the organization with the exploring, creating and implementing of actions so as to coordinate all of its efforts. This LOC supports the development of a common background by sharing moral and ethical values among the various parts of the organization. Indeed, a notion of purpose and mission, and the workforce’s identification with the organization’s objectives, are vital and may help to guarantee appropriate behaviour (Rosanas and Velilla 2005). The boundary system delineates the domain of strategic activity for the employees or business partners (Simons 1995) and provides them with specific behaviour constraints. Therefore, the boundary system helps to make explicit those behaviours that are undesirable. The diagnostic system is intended to motivate components of an organization (such as departments, areas, etc.) to align their performance with the organizational objectives. It allows the organization to analyse progress towards goals and to take corrective action when necessary (Mundy 2010). At variance with the belief system, neither the boundary system nor the diagnostic system targets ethical and moral values. In addition, they are based mainly on formal tools (boundary) and on facts and figures (diagnostic). Finally, the interactive system is focused on the debate of organizational strategic problems and their possible solutions, which implies active and frequent dialogue and a proactive, non-invasive problem-solving approach. Interestingly, this tool needs there to be established common ethical and moral values. In this case, all ideas are considered worthy of examination and evaluation and an open-minded approach the best strategy for resolving problems. Previous research points out that inappropriate use of LOCs could have negative effects, compromising knowledge transfer (Henri 2006). At the same time, the correct use of such systems may support organizational performance since LOCs can generate dynamic tension between opportunistic innovation and predictable goal achievement (Simons 1995). All in all, a MCS must provide objectives and incentives, and support the development of an organizational culture that fosters knowledge transfer (Donate and Guadamillas 2011). Research suggests that both trust (that relies on the ethical and moral values of the business partners) and LOC apply to inter-firm transaction relationship (Bradach and Eccles 1989; Barney and Hansen 1994). Thus, Adler (2001), by expanding the logic of transaction cost economics as developed by Williamson (1988), introduces trust as a mechanism for behavioural coordination in exchange relationships that has equal importance to hierarchical control [such as contracts and other formal tools á la Williamson (1988)]. In addition, he stresses the relevance of the interplay between the two mechanisms for overcoming behavioural uncertainty. All in all, the decision regarding trust (and moral/ethical values) and control tools in business relationships in general, and in knowledge management and sharing specifically, is not a matter of “either/or”: the successful organization should be able to set up the right mix of formal control tools and trust according to the evaluation of the level of shared values, at the ethical and moral level, between the donors and recipients. RQ: How do LOCs interact with trust in supporting knowledge transfer? Considering the broad research question and the existence of four LOCs the main research question is split in four more specific research questions. RQ1: How do boundary LOCs interact with trust in supporting knowledge transfer? RQ2: How do diagnostic LOCs interact with trust in supporting knowledge transfer? RQ3: How do belief LOCs interact with trust in supporting knowledge transfer? RQ4: How do interactive LOCs interact with trust in supporting knowledge transfer? To select the best research method, at least three conditions must be analysed: (1) the type of research question, (2) the extent of control over behavioural events, and (3) the degree of focus on contemporary as opposed to historical events (Yin 2009). Starting with this premise, qualitative methods allow researchers to discover to reveal and understand relationships between variables even within complex processes, and to illustrate the influence of the social context (Shah and Corley 2006). Within qualitative methods, case studies are particularly useful research methods when “a how or why question is being asked about a contemporary set of events over which the investigator has little or no control” (Yin 2009). Therefore, given our research questions and context, this study adopts a case study approach. Eisenhardt (1989) states that “the case study is a research strategy which focuses on understanding the dynamics present within single settings”. Additionally, an essential feature of theory building is the comparison of the emergent concepts, theory, or research questions with the extant literature. Therefore, according to Ridder et al. (2014) the plausible “how” or “why” stems from theoretical propositions and leads to better explanations if the predicted pattern matches the observed patterns and if the analysis withstands rival explanations. Using this approach, a comparison of case study findings by replication is required to extend the validity of results. Indeed, multiple-case studies typically provide a stronger base for theory building, and theory is better grounded, more accurate, and more generalizable when it is based on multiple case experiments (Eisenhardt and Graebner 2007). Our research investigates why and how trust impacts on the control system that network of small and medium enterprises may decide to put into place in order to work together. Thus, we rely on six case studies (extracted from an original list of 207 firms) where each case is in fact a network of two or more firms that operate jointly in a project. The multiple-case study approach we follow allows us to explore the relation by relying on existing theory and by extending it to our specific research context in terms of firm typology (SMEs) and area under study (North East Italy). Ridder et al. (2014) argue that theory generation is a means of detecting new concepts or theoretical constructs, building a novel conceptual framework and propositions, or even developing a mid-range theory by drawing on existing theoretical domains. Even though using a single lens could lead to the creation of “isolated silos of knowledge” (Okhuysen and Bonardi 2011), situating findings within the body of research contributes to the theory-building process by analysing phenomena in great detail (Ridder et al. 2014). Our research identifies and investigates complementarities and differences in the way trust and management control systems are used in networks of SMEs by looking for common patterns and weak/specific facts. In addition, our findings on the role of trust and its relationship with the management control tools SMEs use are compared with previous research and proposed theories/models. The analysis will allow us to capitalize on and accumulate existing knowledge on a the very peculiar relation between management control systems and trust. Indeed, even though trust and control are well analysed topics, their ethical implications within a knowledge-sharing context appear to be under-investigated. Actually, since our analysis investigates management control systems and trust, evidences from the six multiple-case study we relying on allow to extend the existing research within both, management control and trust research streams. Authors who describe their work as based on a case study have to justify why the label is warranted (Bryman and Bell 2007). In addition, methodologies cannot be understood in a vacuum but have to be contextualized (Piekkari et al. 2009). Thus, our study relies on Yin’s (2009) suggestions to develop a piece of case study research and implement four tests to verify the quality of the empirical research: external validity, construct validity, internal validity and reliability. External validity deals with the problem of establishing the domain to which the study’s findings can be generalized. The goal of case study analysis is to concentrate on the uniqueness of the case and to develop a deep understanding of its validity (Piekkari et al. 2009). Therefore, cases must be chosen as “polar types” in which the process of interest is “transparently observable” (Eisenhardt 1989). The analysis should be replicated in similar cases where the same results should occur (Yin 2009). The cases we examine in our research are polar case in the sense that they properly represent the typical case of SMEs network in northeast Italy. In fact, our cases operate in a region that is characterized by a large number of small, usually family-run, firms, sometimes grouped into small industrial districts. In this area, SMEs often operate in networks that become mandatory for them when they have to deal with major investments. Thus, the area considered in the research is characterized by SMEs that have chosen to work in networks and thus take decisions about which knowledge to transfer, how to transfer it as well as how to monitor and control the shared knowledge. The context we investigate in our research represents an ideal research setting since the large number of SMEs and their network makes it rich in “transparently observable” cases with which to analyse the process of interest. In other words, the cases that we examine in our work are not marginal cases but they properly represent a common situation of the area. In order to identify polar types for our research, we followed a very structured process. Firstly, we engage in a conversation with the North East Italy chambers of commerce and the local Chartered Accountants’ Associations. By relying on their dataset we were able to generate a list of firms that were running at least one project (new product development, new process development, new market development) in collaboration with other firms from the region. Thanks to the information obtained by these sources we were able to end up with a list of 207 manufacturing local firms operating in network. Secondly, an invitation e-mail was sent to the owners/managers of the 207 SMEs. The email explained our research project. This step allowed us to identify ideal research settings. Interestingly, 40 SMEs replied to our email. In order to explore whether our sample generation can be affected by selection bias, we look for differences in terms of dimensions, profitability, capital structure, etc. between the original 207 firms and the 40 firms that reply to us. We did not spot any bias. Thirdly, those firms that replied to the original e-mail were contacted by phone so that information could be collected about the characteristics of the firm and the project it was running. An initial sample of firms with similar characteristics was developed in order to allow for replication. Elements of the selection criteria were: revenues (in order to eliminate firms that were too small or too big and concentrate on SMEs), independence of the firms within their network in terms of equity (in order to eliminate equity-based networks), dimensions of the project (in order to avoid those that were too small). Other elements such as the presence of venture capitalists, or of professional managers, were analysed. The original list was sharpened to a group of six totally independent networks willing to participate in the research project in line with methodological suggestions (Eisenhardt 1989). Table 1 reports the key characteristics of the firms involved. Construct validity deals with the need for developing a sufficiently operational set of measures in order to limit subjective judgments. According to Yin (2009), three tactics are available for increasing construct validity when doing case studies: multiple sources of evidence, a chain of evidence, and key informant reviews. To ensure multiple sources of evidence, the CEO (managers or entrepreneurs) of the leading firm of each one of the six networks investigated in the research was interviewed. Each interview was recorded and thoroughly transcribed. Then, the information acquired was checked by asking the interviewed managers to validate the transcripts. Additional documents such as internal reports and examples of contracts were collected and perused to check their consistency with the information acquired during the interviews. Additionally, at least one internal meeting in each one of the six networks was directly observed in order to analyse the relationships of the people involved in the network. At the same time, the minutes of the internal meetings were collected and again compared to other documents. All information was collected in Italian and analysed by the native Italian speaking authors. To develop a chain of evidence, information was marked and coded so that we were able to identify, the source, the moment in time when the information has been generated, the context in which it has been generated. The evidences were then discussed with the participants. Their comments were incorporated through annotations and amendments (key informant reviews). Additionally, the main results were translated into English and discussed with those authors who are not Italian native speakers. The approach we used allowed us to triangulate but the data we collected and the evidences we obtained. Internal validity deals with the problem of making inferences based on spurious relationships. Case study researchers need to pay specific attention to verifying causal relationships. Some of the tactics suggested are pattern matching, explanation building, addressing rival explanations, and the use of a logic model (Yin 2009). Pattern matching requires the identification of dependent and independent variables within explanatory case studies. Comparing theoretical patterns to the empirical ones it is possible to strengthen the internal validity of a case study (Yin 2009). Rival explanation uses the analysis of characteristics that are not specifically addressed within the study that could affect the reliability of the results. The logic model technique involves deliberately building a complex chain of events over time and searching for repeated cause-effect-cause-effect patterns (Yin 2009). In order to identify and matching the patterns we built up a matrix of dependent (control mechanism systems) and independent (high trust and low trust dimensions as well as other related dimensions) variables. Then, theoretical connections between the variables were developed and then evidence confirming or challenging these theoretical connections was summarized. Considering the need to identify rival/alternative explanations, some control variables were used to test the dependence of the findings on some non-observed variables. Reliability deals with the need to demonstrate that the operations of the study, such as the data collection procedures, can be repeated with the same results (Yin 2009). A case study protocol was developed, the first step being the definition of the research question. The literature review and research questions development were the main outcomes of this step. The second step refers to the data selection, which required the development of a list of firms to analyse. As described above, a list of 207 SMEs was the starting point of the research. A two-step screening analysis reduced the original list to six SMEs to be analysed. The third step refers to the data collection procedures. As described above, direct interviews of the CEOs/managers of the selected firms, internal document analysis and direct observation of internal meetings were used to collect data. Table 2 offers a synthesis of the questionnaire used. 1. Could you please describe your firm’s history and activity? 2. Could you please describe your corporate governance? 3. Could you please describe the mission and vision of your firm? 4. Could you please describe your strategy? 5. Could you please describe your organizational structure? 6. Could you please describe your business portfolio? 7. Could you please describe your competitive context? 1. Could you please describe your business network: aims and firms? 2. Could you please describe the characteristics of the firms within the network? 3. Could you please describe the characteristics of the relationships within the network? 4. Do you think that firms involved in the network are acting fairly? Why? Could you give an example? 5. Do you think that firms involved in the network are successful? Why? Could you give an example? 6. Could you please describe how you manage relationships within the network? 7. Could you please describe any control systems you have adopted? 8. Could you please describe the aims of the control tools adopted? The fourth step refers to the data analysis procedure. As described above, multiple data analysis techniques were used. A matrix of dependent and independent variables was produced and evidence was coded and mapped within the matrix. The triangulation of data, techniques and investigators was used in our analytical strategy. This section describes the results of the multiple case study analysis. For each research question, the results are illustrated according to the four tests used to verify the quality of empirical research presented above. All the firms in the sample take part in small-business networks that have been established to target specific aims. These aims require intensive knowledge-sharing activities. An example is provided by firm B (“We both have specific procedures […]. We need to share our procedures for creating something new”) and by firm A (“We are adapting our partner’s technology to our products in order to penetrate a new market”). Case C reinforces the concept, arguing, “we needed to develop a new product using traditional concepts but mixing this with our partners’ know-how”. A similar conclusion can be derived from cases D and E. In all these cases, a major area of concern is to have a clear understanding of the activities that partners can and cannot undertake and how the transferred knowledge can be used. An example is offered by firm F, whose representative states, “we are all good at our specific businesses. The power comes from mixing our abilities to create something new”. Therefore, the cases analysed can be considered suitable cases for the purpose of this study. Table 3 presents a short description of each case analysed. The firms have to share knowledge with network members and in doing so they have to be aware of the ethical implications of this process. To limit the influence of the researchers’ subjective judgments, the data used within this analysis come from different sources of information and are analyzed through tables and a matrix to compare the theoretical statements and collected evidence. Triangulation data and a chain of evidence are presented in the next few paragraphs, following each of the research questions previously developed. RQ1: Boundary LOCs and trust. Boundary LOCs include detailed and complex contracts and other legal documents that can be employed to regulate the relationships among partners, as well as codes of conduct. The firms in our sample use both codes of conduct, e.g. firm B, and contracts (e.g. firm A when working with firm A1). Firm D has contracts with firms D2 and D3. In all these cases there are trust issues. Indeed, in many cases, the relationships are relatively new and the entrepreneurs do not know each other very well. Firm A’s manager states “we have to avoid any leakage of information and prevent any selfish behaviour with firm A1”. Additionally, the representative of firm D states, “we established project milestones and a formal product roadmap when we enlarged the group of firms, opening the network to new partners (D2 and D3) that we could not totally trust since we did not know them”. Interestingly, firm A does not have a contract covering its work with A2, and firm D does not use contracts to work with firm D1. At the same time, firms C, E and F do not use contracts or other boundary systems. In all these cases, trust in the partners is very high. Firm E’s manager states, “everyone knows how to behave, what he or she is expected to do and how”. Firm C’s representative states, “we know each other very well since, in the past, we have developed several projects together. I trust him and his abilities”. All in all, the evidence shows a clear substitution effect: when trust is high, boundary LOCs are low. Details of all of the evidence collected are reported in Table 4. Each row of the table shows a single case study. The columns provide evidence from different sources: quotations, document analysis or direct observation of firms’ behaviours. The last column shows the chain of evidence. Why do we have to spend time in meetings (with E1 and E2) so as to write things down that we already know? Everyone knows how to behave, what he or she is expected to do and how! RQ2: Diagnostic LOC systems and trust. Diagnostic LOCs are focused on comparing performance targets with actual performance achieved. Diagnostic LOCs are connected both with the tool used (budgets and project milestones are typical diagnostic LOCs) and with the way the tool is used (mainly to compare targets and actual results). The firms mainly use budgets, work-in-progress reports and project milestones (usually through software such as Microsoft Project). Firm B uses a formal budget approach to work with firm B1 but not to work with firms B2 and B3. Firm D uses a formal budget to work with firms D2 and D3 but not to work with firm D1. Firm A has developed a formal budget for dealing with firm A2 while using only emails with basic data to deal with firm A1. Interestingly, firms with a high level of trust do not use diagnostic LOCs. Firm B’s representative states, “some of our partners (B2 and B3) have been working with us since we started our business. We are developing our business, our competences and our ability together”. Direct observation of the firms’ behaviour is used to corroborate the data analysis. An interesting case is offered by firm A’s relationship with firm A2. Indeed, when A2 became unreliable and questions were raised about the real efforts it was making, trust decreased and A started to pay more attention to the work-in-progress reports. All in all, the evidence shows a clear substitution effect: when trust is high, diagnostic LOCs are low. Details of all the evidence collected are reported in Table 5. Each row of the table shows a single case study. Columns provide evidence from different sources: quotations, document analysis or direct observation of firms’ behaviours. The last column shows the chain of evidence. RQ3: Belief LOCs and trust. Belief systems are focused on sharing the basic values of the firm(s), which can differ because of different organizational cultures, backgrounds and histories. Typically, belief LOCs consist of mission statements, newsletters and corporate training used to share corporate values. Within the sample of firms analysed, the firms mainly use vision statements, and dedicated parts of their contracts to specify the values of the partnership and training courses. Indeed, firm A uses written values and beliefs of the firm as an introduction to its contract used to handle its relationship with A1. Additionally, firm B used a training programme to train people from B1 who would be involved in the relationship. A specific part of the programme was dedicated to explaining the mission statement of the partnership. Interestingly, in all these cases there are trust issues. Indeed, firm A’s manager states, “if you are working with someone for the first time, like with A1, probably a written contract will let you sleep better, and the first part of that contract in our case was on the specific values of our partnership”. Additionally, firm B1’s representative states, “we are entering new markets with new partners (B1) with whom we have never worked before, so we need to be sure we are on the same page”. Where trust is high, firms in the sample do not organize belief LOCs. This is true in the case of firm C: “We do not need any piece of paper about core values! … We grew up together, sharing the same dreams when we were kids and the same values today that we are entrepreneurs”. Additionally, firm E’s manager states, “I did not even know that these things existed and certainly with E1 and E2 I did not need them. I trust them because I know how they work, the passion and integrity they have in the business”. All in all, the evidence shows a clear substitution effect: when trust is high, belief LOCs are low. Details of all the evidence collected are reported in Table 6. Each row of the table shows a single case study. Columns provide evidence from different sources: quotations, document analysis or direct observation of firms’ behaviours. The last column shows the chain of evidence. RQ4. Interactive LOC systems and trust. The purpose of interactive LOCs is to enhance managers’ abilities to anticipate and effectively manage future uncertainties. Typically, interactive LOCs are tools such as meetings used to enable discussion, and budgets and project milestones, but only if they are used to tie the organization together so that it focuses on common issues and critical success factors, and not as a means to track progress towards goals. Firm E organizes frequent meetings with E1 and E2 to create a dialogue: “In our firm we organize meetings for new product developments with E1 and E2 and every partner has to provide a piece of knowledge that will aid future developments”. Interestingly, meetings appear to be more frequent with partners that the firm trusts more, as in the case of Firm D that “has an average of one to two meetings a week with D1, while with D2 and D3 meetings are rarer”. To corroborate the analysis, direct observation of firms’ behaviours was used. Firm C has frequent meetings with C1. During one of these meetings with C1, an important problem was discussed: there was a mistake on a specific laboratory test made by one of the members of the network. The partners did not blame each other; they all worked together to solve the problem, discussing the reasons for the problem and how to solve it. Another interesting case is provided by firm A in its relationship with A2: “During a meeting an important issue was discussed. Interestingly, the discussion with A2 was not completely open and some pieces of information were hidden. After the meeting, the entrepreneurs said: ‘he is not behaving properly. We should have excluded him from the partnership so we wouldn’t have had to tell him everything’. All in all, when trust is high, belief LOCs are high. Details of all the evidence collected are reported in Table 7. Each row of the table shows a single case study. Columns provide evidence from different sources: quotations, document analysis or direct observation of firms’ behaviours. The last column shows the chain of evidence. To verify the internal validity of the analysis, pattern matching was used. The empirical results of each relationship were compared in order to identify internal inconsistency in each single setting. A synthesis of each relationship is depicted in Table 8. No issue emerged, with all the patterns consistent in a cross-sectional analysis. Additionally, to increase internal validity, rival explanations are addressed. One main research stream is looked at in terms of reasons that could push firms to use MCSs. Davila and Foster (2005) state some variables that could be associated with the management control adoption decision, and here the authors specifically tested the following: the presence of venture capital, CEO experience, the presence of a financial manager and the number of employees. Interestingly, all the firms analysed present different characteristics (Table 1 reports the main characteristics of each firm). Firm B has an internal venture capitalist and is a managerial firm with a distinction between management and property, while none of the other firms has the same characteristics. Interestingly, only firms A and B have a financial manager. The number of employees varies from 7 to 140, thus showing a wide range even though all the firms are SMEs. Interestingly, no pattern emerges from the examination of the firms’ characteristics and their use of control tools. Our findings are thus resistant to the test for rival explanations for management control adoption. The aim of reliability is to minimize the risk of errors and bias by documenting the procedure followed. To achieve this, a case study database was developed, the results of which are reported in Table 9. The evidence we have collected provides clear insights to answer the research questions. High trust levels grounded on shared values can substitute for the implementation of boundary tools and stimulate the sharing of knowledge among business partners (RQ1). The same substitution effect is found between high levels of trust and belief tools (RQ3) and between high levels of trust and diagnostic tools (RQ2). Finally, our results show a synergistic relationship between trust and interactive control tools (RQ4): shared values stimulate trusting relationships that interact with and support the use of interactive tools when firms have to share knowledge. These findings contribute to the academic debate in several ways. First, our results build on knowledge transfer theory. According to Bstieler et al. (2015), business partnerships in research collaboration should be focused on finding active engagement and shared governance. Therefore Bstieler et al.’s (2015) show that an interactive control approach can lead to trust development. However, our results suggest that an interactive approach require as a pre-requisite high levels of trust. Thus, our results build on existing literature and show the existence of a cycle that reinforces itself (Gulati 1995). The more trust in the organization there is, the more the partners will use an interactive approach. The development of interactive control system will increase the levels of trust among partners and therefore the partnership outcome (Bstieler et al. 2015). Additionally, according to Lawson et al. (2009) “social ties between interorganizational development teams to increase the flow of knowledge”. Our results contribute to this literature showing how an interactive approach to management control systems can help this flow. As it is clearly shown by our testimonials, high trust based on shared values implies that firms do not have to set up procedures explaining exactly what can be transferred: on the one hand, this implies that there is no risk of important information not being shared because someone thinks it cannot be shared with the business partner; on the other hand, the risk of bottlenecks in knowledge transfer (e.g. due to the need for authorization) is incredibly reduced and thus potential constraints on the flow of information are avoided. This point is made clear by the case where a group of employees of the partner firm had to be trained. The high level of trust facilitated the process and gave the firms the possibility of sharing effectively all the information they needed. This is not just a marginal benefit that firms can enjoy since, in the knowledge society, sharing information in an effective and efficient way is extremely important for success. As far as the pace of knowledge transfer is concerned, the benefit of relying on trust can be incredibly relevant. Indeed, the pace at which the knowledge-based economy is evolving stresses the importance of sharing rapidly, but in a very secure way, information among business partners. The time that might be needed to discuss and set up a contract, implement a diagnostic control system or discuss, write and share a vision and mission statement could adversely affect the success of a product. Second, the impact of trust on knowledge transfer can contribute to the management control system design theory. Traditional managerial theories tend to consider business actors as parties to a conflicting relationship where the gain obtained by one party comes at the expense of the other. Thus, these theories suggest that, in order to curb the potentially adverse behaviour of the counterpart, formal and intrusive control tools are needed. In fact, our research findings suggest that such an approach is an oversimplification. Moreover, such oversimplified approach can be even dangerous. The traditional theories dismiss any role of shared value and quite often they consider them as dangerous (Williamson 1993). Interestingly, they ground such a claim on the classical economic approach and on Adam Smith’s “The Wealth of Nations”. Meanwhile, they neglect to consider what Adam Smith wrote in “The Theory of Moral Sentiments”. Actually, the joint interpretation of Adam Smith’s work supports the very important role of values in business relationships (Smith 1998). Thus, it is not a surprise that, in line with research that argues for the important role of trust in business relationships, we find that high trust based on shared ethical and moral values can support the sharing of knowledge among different firms in a network by substituting for intrusive control tools. These results build on Ditillo (2012), who argue that “the design of management control systems should consider various forms of relationships between individuals (strong/weak, direct/indirect) that these systems activate and that are necessary to transfer various forms of knowledge (process, outcome, technology or opportunities)”. In line with previous works on trust, our findings suggest an interesting set of implications that firms can face when they rely on values and thus exploit the trust they have in their business partners: firms can reduce the costs linked to the implementation of control tools; they can increase the amount of information that is transferred; they can increase the pace at which information and knowledge is transferred. Indeed, as far as the cost reduction is concerned, we do not propose any figure. Nevertheless, there is no doubt that, because of the possibility of exploiting common values and the trust that builds on them, firms can avoid incurring additional costs. One of the entrepreneurs interviewed argued that they had been able save on legal fees since they had not needed legal support for writing up contracts. We consider this an enlightening example of how savings can easily be obtained. Interestingly, the savings are not only linked to boundary systems. Firms can avoid spending time and resources writing down detailed mission and vision statements as well as spending time discussing and sharing them with their partners. Similarly, firms can escape implementing complex and detailed diagnostic tools for checking the performance of each member against what is expected: this implies savings in terms of the upfront one-off investment linked to buying the control tool but also in terms of the ongoing costs (both resources and time) that would have to be allocated to the monitoring activity. These considerations are particularly relevant for SMEs, which traditionally suffer from higher resource constraints in terms of time, financial resources and competences when it comes to developing and managing complex control systems. One final additional point must also be stressed: the fact that the implementation of diagnostic, boundary and belief control tools can compromise the development of trust. Indeed, as pointed out by previous research on trust (Mayer et al. 1995; Deutsch 2000), behaviours that show low trust in the counterpart tend to be reciprocated. Thus, trust can spiral down. In other words, not only can trust substitute for boundary, diagnostic and belief systems but it is not neutral to the implementation of such tools. This means that, when an organization implements diagnostic, boundary and belief tools, it can in some way compromise the prospective level of trust, reducing the possibility to exploit it. In other words, the firm can enter into a loop where, because of the implementation of control mechanisms, the actors will tend to behave in an untrustworthy manner that will in turn stimulate the implementation of additional, more complex and more expensive control tools. The present research analyses the effect of control systems and trust on knowledge transfer in SME networks. Previous research argues that there could be a link between trust and control but has not thoroughly investigated such a link, nor the joint impact of trust and control on knowledge transfer. The analysis relies on case studies developed with six SMEs operating in northeast Italy. The findings suggest that belief, diagnostic and boundary control systems are antithetical to trust with respect to supporting knowledge transfer, while interactive control tools work synergistically with trust in supporting knowledge transfer. Our findings are at variance with the traditional managerial theories that, by postulating a conflict of interests between business partners, argue that control mechanisms are mandatory for ensuring that business relationships are not dysfunctional. In fact, they are in line with previous research in the realm of trust that explains the important and positive role trust plays in business relationships. In particular, we have pointed out the fact that, when trust grounded on shared values is in place, firms can enjoy more effective and efficient knowledge transfer: they can save on costs and investments in the implementation of control tools; the amount of knowledge transferred increases; the pace at which the knowledge is shared increases. These findings have managerial implications for firms in general and for SMEs particularly. However, this research has limitations that open the door for new and additional research. Firstly, the sample used contains firms operating in networks of SMEs in northern Italy. This limits the possibility of generalizing findings: it could be useful to reproduce the research in other countries. Secondly, we only examine SMEs. In fact, SMEs’ dimensions help them to exploit trusting relationships and ethical/moral values. Indeed, within these firms, personal relationships may play a greater role in business relationships. It could be interesting to examine to what extent our findings hold in the context of large organizations. Notwithstanding the stated limitations, this research, relying on an in-depth analysis of rich data, is a significant step forward in the examination of the role trust and control mechanisms play in the transfer of knowledge in SME networks.